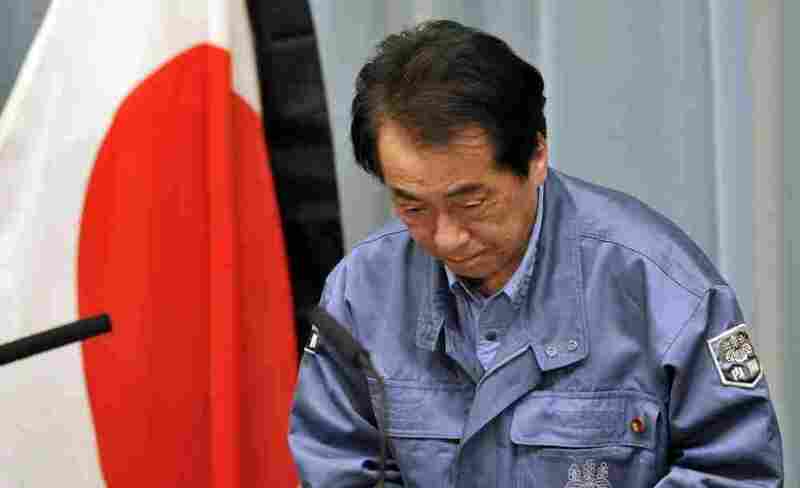 Japanese Prime Minister Naoto Kan bows as he holds a news conference in Tokyo on March 25, 2011. Japanese Prime Minister Naoto Kan says the nuclear disaster at Fukushima is "grave and serious". Earlier, the government called for more people to leave a wider area circling the stricken nuclear complex. It's been two weeks since a magnitude 9 earthquake and gargantuan tsunami overpowered eastern Japan, triggering a crisis at a nuclear complex with four troubled reactors. Today, Kan gave his first news conference in a week, discussing the dire situation facing his country: "We are not in a position where we can be optimistic. We must treat every development with the utmost care." The AP notes Kan said the government would assist displaced Japanese to find permanent shelter and he offered a 'heartfelt apology' to the farmers and dairy farmers for their troubles. Vegetables and milk exports have been banned from affected prefectures as they show signs of irradiation.